It’s time to rethink the role of primary care in your health benefit strategy. Employers have invested in countless initiatives to reduce spending and improve employee health outcomes. While these programs have varying degrees of success, employers are looking for new solutions that can have substantial long-term impact. 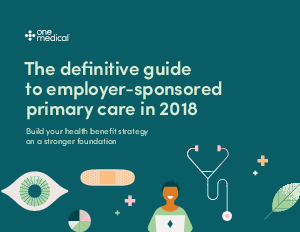 Done the right way, primary care is uniquely positioned to be one of the strongest long-term solutions for employers. The proof is in the numbers: when patients have better access to primary care, the total cost of care is reduced by 4 to 5%. Our comprehensive eBook will show you how to lower health costs and improve employee health outcomes.